Precision Art Dental Lab | Ralph Lira, C.D.T. About Precision Art Dental Lab, Inc.
Ralph Lira, C.D.T. has over 30 years of dental lab experience. Ralph became certified in complete denture in 1991. He has extensive training in the Earl Pound technique utilizing lingualized occlusion. Ralph has attended many continuing education courses presented by Dr. Sharifi and Dr. Turbyfill. He is proficient in All on 4 and other types of hybrid and overdenture cases. 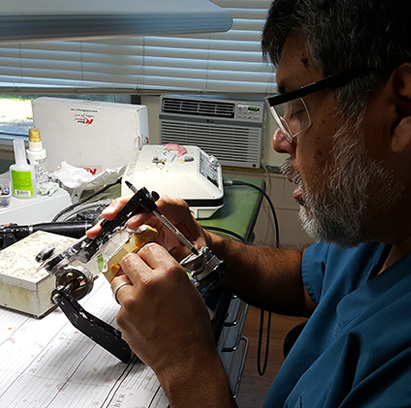 Ralph began his dental technician career working for a small full-service laboratory in Topeka, Kansas where he began to learn about removable prosthetics. After working for 5 years at that lab, Ralph decided to try his hand at crown and bridge, spending 3 years working in that area. From there, he worked as an in house technician for a general dentist which led to an opportunity to work side by side with a prosthodontist in Kansas City, Mo. After the untimely death of his employer, Ralph found an opportunity to do removable prosthetics by contract with Functional Esthetics in Lewisville, TX. After spending five years working with the high quality team at Functional Esthetics, Ralph made the decision to move his laboratory closer to his home in Denton, TX and opened Precision Art Dental Lab in December of 2001. Ralph firmly believes that the best work can be done only with good communication between the laboratory and the dental office along with the appropriate dental records that are sent with each case. He is available to discuss any questions or concerns throughout the work day. Ralph’s wife, Susan, works along side Ralph in the dental lab. Susan fills the role of manager, accounts payable/receivable, scheduling and local pickups/deliveries. She can also be found doing benchwork as needed. Susan has had experience as a chairside dental assistant, but before working in the lab, she was employed as an office nurse for an OB/GYN in Denton. Copyright © Precision Art Dental Lab, Inc. | All rights reserved.